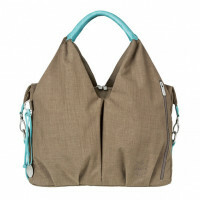 Sustainability with class is what the Green Label Neckline Bag promises. 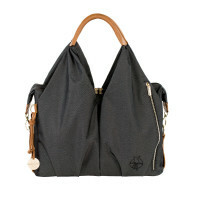 Made of recycled PET bottles in addition to PU and polyester, this stylish diaper bag also conserves natural resources. 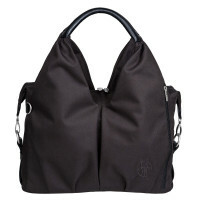 description & equipment Sustainability with class is what the Green Label Neckline Bag promises. 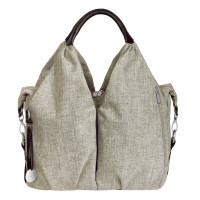 Made of recycled PET bottles in addition to PU and polyester, this stylish diaper bag also conserves natural resources - even after your nursing days are done. 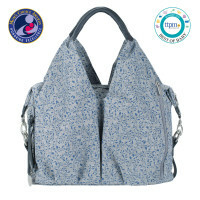 In a trendy denim-look, the accessory is neatly arranged inside with plenty of room for personal items as well as baby implements. 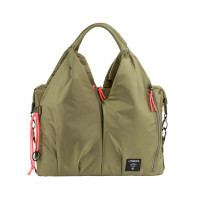 The bag also comes with many accessories, including a water-repellent changing pad, insulated removable bottle holder, accessories pouch, removable baby food jar holder, stroller attachment and an additional, height-adjustable shoulder strap. 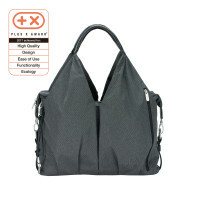 There is a convenient place for your cellphone in the outer pocket, keys can be attached directly to the key chain, and baby wipes go in the special compartment provided for them in the interior of the bag. Like all diaper bags, the blue denim Neckline Bag has a water-repellent wet compartment. 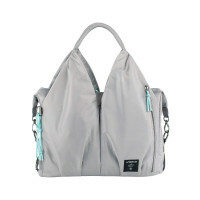 There is also an insulated zippered compartment on the outside to keep drinks cool or warm. A perfect allrounder strolling through town - even after you are done with diapers.